John Cutler has kindly kept me in touch with his hedge laying. I wrote a first update, with some photos, here. 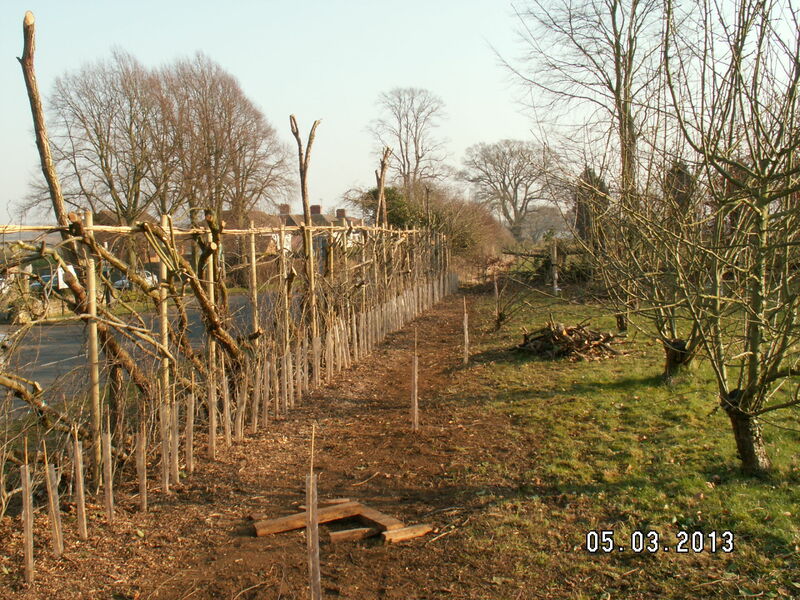 This photo shows new planting along John’s front hedge. His son Quinn (whom I used to teach) helped him plant 165 plants: fifty hawthorn on the original line to fill gaps and the remainder on garden side to form a double row to encourage wildlife. These plants are of six other species: hazel, crab apple, wild pear, damson, cherry plum and sweet briar. Also visible is ‘dead hedging’ which is twigs stuck in to make it look less gappy until some growth appears in a year or two. This entry was posted in Uncategorized and tagged Northampton by ianmac55. Bookmark the permalink.